Choosing options for training many people want to enhance the functionality of their body. In doing so, they are not always ready to attend gym or engage in team sports. In this case, you should pay attention to the Calisthenics. You will have a wide variety of exercises with your body weight and minimum equipment available. You can increase strength and endurance. 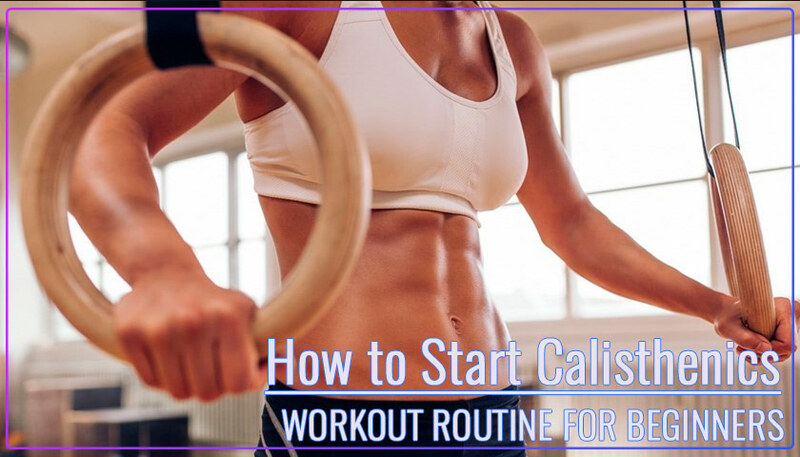 So let’s take a look at the topic of How to Start Calisthenics and get results quickly. Consider what the key benefits of this type of training and what results you can expect. You can perform the exercises without additional equipment. You can go to the nearest sports ground or Park and run workout. So just keep practicing if you are on vacation or traveling. You are not limited to the possible time of the workout. Coach at any time convenient for you. Duration of workouts you also define yourself. It makes good use of their leisure time. You don’t need to spend time getting to the gym. A large part of exercises you can perform even at home. You don’t need expensive equipment or equipment. Will be quite comfortable sports clothing and footwear. If you want to train at home you will need a fitness mat which is available. And any additional equipment will cost no more than a hundred dollars. You develop more comprehensively. Improves flexibility, endurance, speed and power. Gaining muscle tone you become more flexible and this prevents injuries in the future. In addition, your body becomes more functional. You can easily climb a mountain, become more coordinated. In the future this training makes it easy to start to engage in martial sports, play basketball or football. The muscles will be more resilient and receptive to training weightlifting. You don’t get this load on your joints as if weights or running at large distances. No extreme loads on the heart. Of course, you must also perform the workout and follow heart rhythm making breaks between exercises. Most basic exercises comprehensively develops and shapes the body effective muscular corset. More likely you have not left lagging muscle groups. Integrated load improves metabolism. The intense workout burned a lot of calories and burns excess fat. No matter how old you are. Calisthenics exercises will bring you a favor if you don’t have serious contraindications. But even in the case of health problems you will be able to train after agreeing with mailed physician possible restrictions and amount of load. A wide range of exercises allows creating a training program that fits the girls or guys. Simple start is available for all. In any case, you must purchase a basic understanding of the principles of training. This will allow you to more intelligently shape your training process. Use an integrated approach to training. For the formation of this knowledge you can choose for yourself one of the most convenient source of information for you. YouTube is suitable for the most lazy. Here is a great example of a video on the topic “How to Start Calisthenics”. Ask questions and get answers in the form of videos. After reviewing several video select the most useful for you feeds and subscribe to them. If you have any questions ask them in the comments below the video. This is no substitute for live communication, but can be useful and understandable. For the beginnings of the try just repeating simple exercises. A large part of the ideas already invented and described in the books. You can buy an electronic version of the book or the audio book and listen to its contents in time. Why is it better than Google? In the books of information more reliable. Maybe it is the best solution. Live communication with coach and better joint training 1-2 will evaluate your current state. You can quickly get answers to your questions. The coach will pick up an optimum set of exercises for you individually and will provide a number of useful recommendations. You can use any of the exercises and their variations. It is desirable that the workouts were varied. This will constantly evolve. Consider the basic exercises for different muscle groups, you can do without equipment. You will need only a horizontal bar and mat for fitness. Great exercise allows you to train the muscles of the chest, triceps and shoulders. The basic version of the exercise is performed with a moderate hand staging. Technique is shown in the image. For convenience, the handles can be used. They will reduce the strain on wrists and do the activity with greater amplitude. Possible variations of Diamond push-ups, Bench Dips, Clap push-ups, Spiderman push-ups and others. Using these options we can do push-ups our workout more efficient. To perform pull-ups require horizontal bar. Having hung on the horizontal bar without rocking through the reduction of back muscles lift the chassis while Chin will not. On the highest point of the shoulder blades are reduced. Through this exercise, you develop your back muscles. Dips allow train triceps and chest muscles. There are also several variations of exercises. In one case, you need bars. Equipment exercise is shown in the image. You omit the chassis until the hands will not be bent at the elbow to 90 degrees angle. If you do not have bars you can run another option exercises. Need a bench or Chair. You lean your hands on the bench. Feet put on the floor or can also be installed on a chair or bench. Bending arm body falls to the floor and returned to its original position. Simplest and effective exercise for muscles. Also, has many variations. You can use an inclined bench, perform twists and other variations of the movement. In any case this exercise strengthens muscles qualitatively press. Squats allows you to train the muscles of the legs. When performing this exercise, it is important to comply with proper technique. Keep your back exactly, keep your heel from the floor. To increase load, you can use any available weight. This exercise engages large muscle groups. This promotes the release of hormones that stimulate muscle growth. It is therefore important to include in such training exercises that increase anabolism. Plank allows to train the muscles of core and waist, making them stronger and hardier. It is important to form a muscular corset protects internal organs. It also allows more correctly perform exercises with additional weight holding down the back straight. This exercise builds beautiful legs and buttocks. It perfectly complements the squats. You can do it standing still or moving forward stepping alternately on each leg. If exercise is too simple for you, you can use the extra aggravation. This can be a dumbbell or kettlebell. They can hold ourselves or take in each hand and carry the drooping along the hull. We’ve already covered what exercises you can Start Calisthenics. The focus that you need is the desire to play sports. For the most part exercises used your own body weight. But if you tap into easy-to-use and affordable costs additional equipment you will be able to do more different exercises. So let’s look at the most useful Calisthenics Equipment. The power tower combines a horizontal bar, bars, push-up handles and a roman chair. Some models are even more functional. You will be able to perform the following exercises: pull-ups, chin-ups, dips, leg raises, pull up and vertical knee raise. Earlier we described in detail Power Tower Workout Routine. This equipment will also be useful if you want to train at home but you do not have the ability to mount the horizontal bar in the wall. Choosing a power tower for home is worth paying attention to the weight limit. The cost of such equipment starts from the amount of one hundred dollars. It does not take much space and is multifunctional. Gymnastic Rings is a universal tool that allows you to train different muscle groups. Now they are becoming popular again. In fact, they give a lot of opportunities. You can adjust their height and perform exercises for different muscle groups. Pull up, do dips, push-UPS. Their cost is affordable and at the same time they are durable. You can hang them anywhere. They won’t take up any space. At the same time they can be used by athletes of different levels of training. To perform the exercises you train not only the main muscle groups but also stabilizers. This greatly improves your functionality. We recommend that you try to use them in your training. This is an easy way to install the horizontal bar in the doorway. You can easily install if necessary. The main exercise with this equipment is pulling. The main advantages of the Doorway Bar are low cost, ease of use and versatility. Depending on the shape of the structure in some cases, you can use this equipment as a stand for push-UPS. In some cases, you will not be able to adjust the height. This drawback should be provided in advance before purchase. The rest of the Doorway pull up Bar is a good opportunity to perform pull-UPS at any time without leaving the apartment. It is convenient and saves time. The use of the AB Wheel exercise makes your muscles more efficient and diverse. The exercise trains the abdominal, core and lower back. You not only develop endurance but also form the basis of the body. Exercises with a roller will be useful for functionality. It is important to use them for representatives of combat sports, weightlifters, fans of team sports. The main benefits of AB Wheel is an affordable cost, small size, the effectiveness of the exercises with it. Most of the models are collapsible rollers. You can easily take it with you to practice anywhere. The resistance bands is a generic substitute for trainers. You can simply stretch the bands, or tie one end to something and use the drag as an extra load. They can have different density and length. You will be able to apply the bands to train almost all muscle groups. The easiest thing you can do is to step on one end of the strip and the other to raise in the opposite direction. At low cost, the resistance bands are versatile. They will be useful for both beginners and more trained athletes. They won’t take up much space in a gym bag. Recently I actively use them in my training. Apply both for warm-up, and in difficult coordination exercises. These Stands are a structure that allows you to perform DIPS. You can set them in any free place and perform various exercises with your own body weight. With this equipment you can train the muscles of the arms, shoulders, forearms and press. The advantage of DIP Stands is low cost, compact size, ease of use. Choosing necessary to consider the size and in particular the distance between the arms. Also it is desirable that the handle was non-slip. Note that the legs contain non-slip pads. This will increase stability. Push UP Bars allow you to perform push-UPS as conveniently as possible. The amplitude of the motion becomes larger. Muscles stretch more and training is performed more intensively. Also, these handles allow you to perform the exercise even if you experience discomfort in the wrists. Jump Rope allows you to perform high-quality warm-up. Its use is similar to cardio exercises. You burn a lot of calories fast and easy. Jumping rope perfectly tone the muscles of the legs and improve coordination. You can use basic exercise or its variations. This can be jumping on one leg, double jump and so on. This is a fairly cheap fitness equipment. It doesn’t take up much space. But its use is very useful. The choice of options is large enough. We recommend taking into account your growth. Handles should be comfortable. In one of the next reviews we will give more detailed recommendations for the purchase. When using a Weighted Vest you will be able to improve your results. This accessory is required if the exercise is too easy with your own body weight. Using extra weight you reduce your workout time and make it more varied. Weighted Vest also improves endurance. Usually performed standard exercises pull-UPS, dips, push-UPS, jumps. Such training allows you to overcome the plateau and stagnation of results. Ideally, the weight should be adjustable. The vest contains pockets in which you can put filler. Beginners will probably not need it, but it will be important for those who are already training and want to improve their performance. Stability ball is a great complement to your home gym. With him you will have the opportunity to perform exercises for the abdominal muscles. An important advantage of using such a ball is the inclusion of muscle stabilizers. You can also use this equipment for exercises to relax, relieve tension from the spine. Using the ball is useful in complex training. With it, the plank exercise will be both more effective and more interesting. Similar to any other exercise. We recommend you to pay attention to this accessory and maybe you will actively use it in the future. We do not recommend beginners to train 7 days a week. The body is important to have time to recover. This will avoid over-training and overall progress will be better. It is necessary to gradually increase the load and intensity. The duration of training should be about an hour. Initially, it is better to perform a comprehensive training on all the muscles of the body. After some time, it is possible to divide the training into muscle groups. Consider an example of a training program for a week with a training mode every other day. It can also be useful this video where the details of the exercises and typical mistakes of beginners. I hope this article will be useful to you. If you still have questions ask them in the comments. We will be glad to answer and comment. Thank you for this guide. Decided to try a similar version of the training. Thank you for so much detail about everything you write. This is really important for beginners.